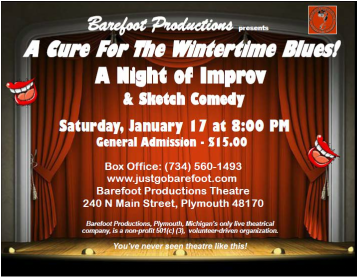 The Show: A mix of written and improvised material that will have the audience in stiches from beginning to end. All ages are welcomed; however some harsh language is present so a PG-13 rating is advised. Griffin Burke of Northville, loves: 3am infomercials, hates: the Pillsbury Doughboy. Nathan Corliss of Ypsilanti, loves: the sound of a ringing cowbell, hates: flossing. Karen Curtsinger of Canton, loves: writing to her Congressman, hates: plague carrying rats. Adrian Diffey of Ypsilanti, loves: Singing Beatle songs in karaoke bars, hates: prank calls. M. De Lisle of Ypsilanti, loves skipping across Einstein-Rosen bridges, hates: Long lines at checkout. Michelle McAlpine of Northville, loves: fine art, hates: paper cuts. Rachel Richardson of Canton, loves: drag racing, hates: returning library books late. Jeannine Thompson of Dearborn, loves The Rocky Horror Picture Show, hates: warm pop. Under the misdirection of Matthew and Timothy Majzlik, The Brothers Majik of Canton and Ypsilanti. A lot of effort, passion, and carbon dating went into this show. We hope you like it.